The Rockies have one of the most talented offenses in baseball, and their home ballpark plays a factor in some severe home road splits for a few guys. Despite Coors being a huge factor, this is a solid lineup top to bottom. Charlie Blackmon and Nolan Arenado are two of the better bats. Arenado continues to mash in the middle of the order, but he has some backup with Trevor Story behind him. He is a bit strikeout prone, but Story has tons of speed and power. Colorado added Daniel Murphy, who continues to be one of the better pure hitters in baseball. He will get a bump in Coors, and being smashed in between some of these names. If David Dahl can stay healthy, we will be seeing Colorado compete late in the year once again. Pitching in Coors is one of the toughest things to do, and the Rockies pitchers are already ad a disadvantage pitching half their games in the high altitude ballpark. 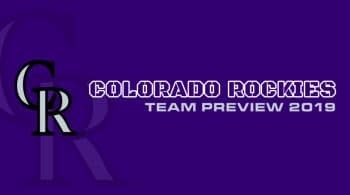 The Rockies seem to rotate who the breakout arm is each year. We have seen Jon Gray and Tyler Anderson breakout, while it was Kyle Freeland and German Marquez who did it last year. If the rotation could put it together at the same time, the last few seasons would have gone a lot differently. Freeland had a successful 2018 season, winning 17 games with a 2.85 ERA. The ERA is expected to go up about a full run, but Freeland is projected to hit the 200 innings mark, and still provide solid peripheral numbers. German Marquez had a huge season with 230 strikeouts in 196 innings. He finished the year with a 3.77 ERA, but in the second half he was unbeatable with a 2.61 ERA and 34% strikeout rate. Projections are looking at Marquez to continue this type of pitching, as his arsenal translates well with Coors, and his velocity is up as well. We also have to remember that these arms will be facing San Diego, San Francisco, and now Arizona which all project to be bottom half offense. Jon Gray is someone we want to show more consistency. He took a step back in 2018 boasting an ERA over five, but had a 3.47 xFIP. He allowed 1.41 HR, which was up quite a bit from the last two seasons where he kept it under one. Expect those numbers to trickle back down and even out. He had a 12.3% swinging strike rate, and averaged 95 mph on the season. Tyler Anderson is the other Colorado name who is going to sport a more league average pitching line this season. He had the second highest ERA on the team, and it was the home runs that killed him. His batted ball stats were not as friendly when trying to prove it was some bad luck. Anderson is going to need to keep the ball in the park this year. Antonio Senzatela and Chad Bettis will likely be the guys rounding out the rotation, as both are below average right-handed options.